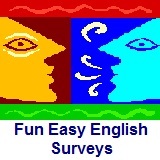 ﻿ Fun Easy English - new american english study practice reading writing survey poll opinion questionnaire do you think the welfare system in america is working. Home - Survey - Do you think the welfare system in America is working? Do you think the welfare system in America is working?